Good morning, Friends! It's time for another Thursday challenge from the Create with Connie and Mary team! This week we have a fun color challenge! Take a look at these fabulous colors! 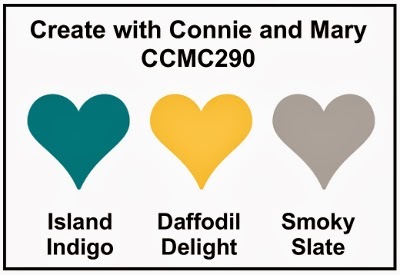 Island Indigo, Daffodil Delight and Smoky Slate. Love these bright cheerful colors! And here is how I used them! I kept my card very simple! Super simple! Find more fabulous inspiration from the rest of the designer team at the Create with Connie and Mary site! I hope you will play along with us this week and show us your beautiful creations using these colors! Thanks for stopping by and have a super day! 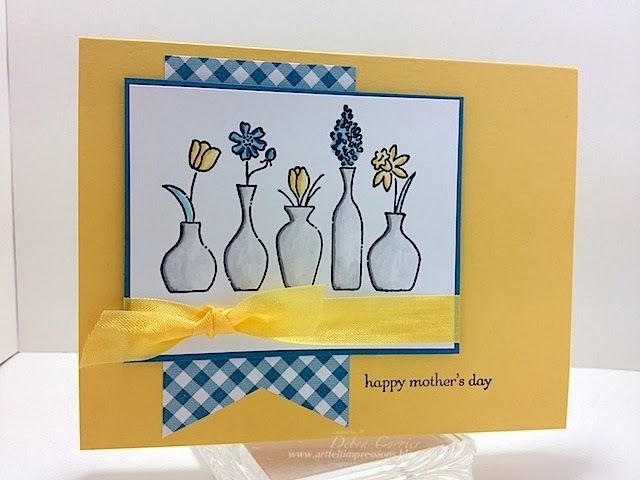 A very pretty card Deb - I was drawn to the Gingham check DSP paper when I saw the challenge colours too - looks great behind the beautifully coloured flower vases. Love the classic elegance of your card! SO pretty! Great job with the color challenge! I love your card, Deb. The flowers, the gingham and the shading on the vases - it is absolutely lovely! WOW! The vases on the Whisper White! Busting with bright color! Great subtle coloring of the vases & flowers and the layers look great! Beautiful clean and simple card! Your design really lets the flowers in vases take center stage! I love how bright and cheerful, clean and simple and springy this is! Such a pretty card! SSSC 205 - Happy Valentine's Day!